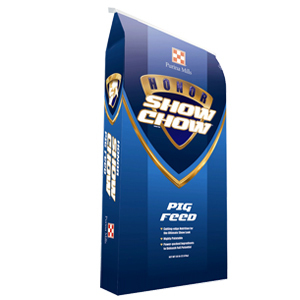 Honor Show Chow PRELUDE 309 feed is designed to be fed to pigs weighing 16 to 25 lbs, but can be fed to heavier pigs. Offer PRELUDE 309 feed as a phase 2 pig starter when pigs are about 28 days of age or weigh 16 lbs. Honor Show Chow PRELUDE 309 feed is supported by Purina. Get your newly weaned pigs on PRELUDE 309 feed today so you can unleash your genetic investment. Organic acids, yucca schdigera extract, and high levels of vitamins. Medicated for pigs weighing 16-25 lbs. For the control of swine dysentery associated with Brachyspira (formerly Serpulina or Treponema) hyodysenteriae susceptible to tiamulin and for treatment of bacterial enteritis caused by Escherichia coli and Salmonella choleraesuis and treatment of bacterial pneumonia caused by Pasteurella multocida susceptible to chlortetracycline. Offer HSC PRELUDE™ 309 CTC/DEN to pigs weighing 16 to 25 lbs in bodyweight. Feed continuously as sole ration for 14 days. Feed 0.25 lbs per every 10 of bodyweight to provide 10 mg/lbs bodyweight chlortetracycline. Warning: Withdraw medicated feed 2 days before slaughter. Caution: Do not feed to animals other than swine. Use as the only source of Tiamulin and Chlortetracycline. The effects of tiamulin on swine reproductive performance, pregnancy and lactation have not been determined. Swine being treated with tiamulin should not have access to feeds containing polyether ionophores (e.g. Monensin, Lasalocid, Narasin, Semduramicin and Salinomycin) as adverse reactions may occur. If signs of toxicity occur, discontinue use of medicated feeds. DO NOT FEED TO SHEEP DUE TO HIGH LEVELS OF COPPER. Special Considerations: Protect from excessive temperatures (temperatures that exceed 40 degrees C or 104 degrees F). Do not store at warm temperatures up to 104 degrees F (40 degrees C) for more than 7 days.